Germany's showpiece fixture is hardly what many would consider a textbook rivalry, as Bayern Munich and Borussia Dortmund's animosity only really started to grow during the early 1990s. However, Der Klassiker is now one of the most sought after fixtures on the footballing calendar around the world, with the classic game set to have its Bundesliga centenary this weekend when the two sides meet in one of the most highly anticipated clashes in years. Here's a look back at six of the best moments from the last 54 years of Der Klassiker.  Reinhold Wosab wird 80! Wir wünschen von  alles Gute! The first-ever meeting between Bayern Munich and Borussia Dortmund didn't take place until 1965, and prior to the Bundesliga forming two years earlier, football clubs played in their local regions. When the two sides did eventually meet at Bayern Munich's old Grünwalder Stadion, Zlatko Čajkovski's star-studded hosts suffered a defeat to a Borussia Dortmund side who would go on to finish second in the Bundesliga, one place ahead of the Bavarians. BVB's versatile star Reinhold Wosab - who played in defence, midfield and attack throughout his career - combined with Lothar Emmerich to score the only goal of the first half, putting Willi Multhaup's side into the lead. Franz Beckenbauer went on to miss an early second-half penalty before Wosab and Emmerich combined once again to double Borussia Dortmund's lead and secure all three points against for the Black and Yellows. It will come as no surprise that the Bundesliga's record for the most yellow and red cards in a single match came was during Der Klassiker. When the two sides met back in 2001, Roque Santa Cruz wasted no time in getting Bayern Munich on the front foot by firing a right-footed effort past Jens Lehmann and into the back of the net. That was the last of the goals for the first half, but six players had received yellow cards by the time the half time whistle went, while Bayern Munich's Bixente Lizarazu - who set up Santa Cruz's goal - picked up two to be sent for an early bath. Fredi Bobic pulled Borussia Dortmund back on level terms just after the restart, and things went from bad to worse for Bayern Munich when midfielder Stefan Effenberg picked up a straight red card soon after. While there wasn't enough time for either side to grab a winning goal, the cards continued to be dished out throughout the second half. In total, 12 yellow cards were shown at the Westfalenstadion, while Evanilson's late sending off ensured three players who started the match didn't finish it. Well before Bayern Munich and Borussia Dortmund became the fierce rivals that they're known as today, the two clubs were involved in a 12-goal thriller which stands today as the Bavarians' record win. It was the Gerd Müller at the Grünwalder Stadion on 27 November, 1971, as Der Bomber scored four goals in Bayern Munich's biggest ever win. He scored the club's first and fourth goals before half time, with Uli Hoeness and Willi Hoffmann scoring in between. Hoeness then notched his second of the match just after the break, something which sparked a 15-minute spell which saw five goals fly into the back of the net to leave the scoreline at 8-1 to Bayern Munich with 25 minutes left on the clock. 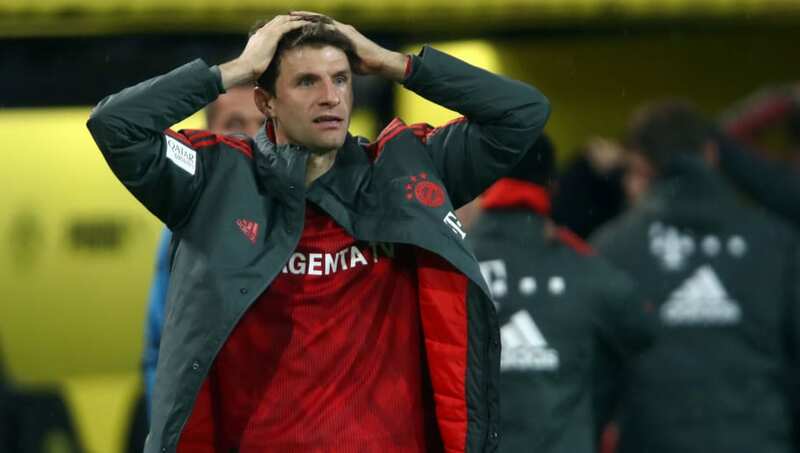 Müller then added two more either side of a second goal from Franz Roth to secure the club's biggest ever win, while Dortmund's 11-1 defeat would be usurped seven years later in a 12-0 loss to Borussia Mönchengladbach. It might not have seemed like a historic goal at the time, but Paco Alcácer's match-winning striker in the first Klassiker of the season has put Borussia Dortmund in the driving seat of the title race. It was a frantic game that quite easily could have swung in the favour of Niko Kovač's side, especially as Robert Lewandowski put Bayern Munich in front during his visit to his former side. Marco Reus was able to level things up, but Lewandowski scored just four minutes later to put the Bundesliga's record champions back into the lead. Dortmund's Reus pegged Bayern Munich back once again, but it was Paco Alcácer's delightful chip over Manuel Neuer which has helped to set up one of the most exciting Bundesliga title races in recent memory. Alcácer's aforementioned chip by no means settled the Bundesliga title race this season, but a penalty save from former goalkeeper Roman Weidenfeller did back in 2012. It was matchday 30 and Borussia Dortmund were three points clear of Bayern Munich at the top of the table when the Westfalenstadion hosted Der Klassiker, but it looked like it would be as you were as both sides headed for a draw in the final 15 minutes of the match. That was until Robert Lewandowski - then at Borussia Dortmund - instinctively backheeled Kevin Grosskreutz's shot past Manuel Neuer to put the hosts into the lead with the clock ticking down. But Bayern Munich were handed a lifeline when they won a penalty which Arjen Robben, the Bundesliga's most in-form player with six goals and five assists in the five games before Der Klassiker, stepped up to take. The Netherlands international had never missed a penalty in his Bundesliga career at the time, but his left-footed strike was clawed out of the bottom corner by Weidenfeller to retain Dortmund's lead and send them six points clear - eventually to their eigth, and most recent, league title. Missing a title-deciding penalty was one thing for Robben, but he would be able to get his revenge the following season in the Champions League final at Wembley. Dante's yellow card was the only thing of note from the first half of football, but Robben stepped up to break the deadlock by putting the ball on a plate for Croatian striker Mario Mandžukić to tap it into an empty net. Bayern Munich's joy was short-lived, however, as Ilkay Gündogan brought Borussia Dortmund back into the game from 12 yards after Marco Reus was fouled in the penalty area. The Champions League final looked set to be going to extra time when, in the 89th minute, a half-hearted backheel from Franck Ribéry found its way to the onrushing Robben who was able to squeeze the ball past Weidenfeller in iconic fashion. It's a moment which has been imortalised in Bayern Munich's history, as well as that of European football, and to this day it remains arguably the most talked about moment in the history of Der Klassiker.